Create a wardrobe foundation that never goes out of style with this easy knit jersey top from Modern Soul. 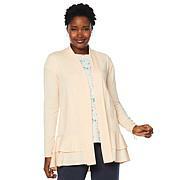 An easy pullover design, A-line sweep and pleat details transition seasons and trends with ease. The reason you buy this top is to match back to the cardigan with the ruffle. Gosh, its a GREAT Look! Im size 16-18 and large busted. Got the 1X and kept it for a different look, then ordered an XL. You pay top dollar because the quality is That Good. The fabric is very soft, but substantial. Not heavy, just right. I bought the oatmeal to go with the olive pants, exactly what the lady in the video is wearing and it is SO CUTE!! Getting other colors. Dress up with heels or down with sandals! This is such a cute version of a t shirt. The material is nice and thick not cheap and flimsy. The back gatherings are so cute and flattering. I got the floral print and the black. Size 2x which is my normal size and its spot on. Love the lilac color and flattering style. Would purchase in other colors. This top is a feminine beauty! The fit is generous, but not oversized. A-line fit. I ordered the light floral cream and I love it! From street style to office fashion. 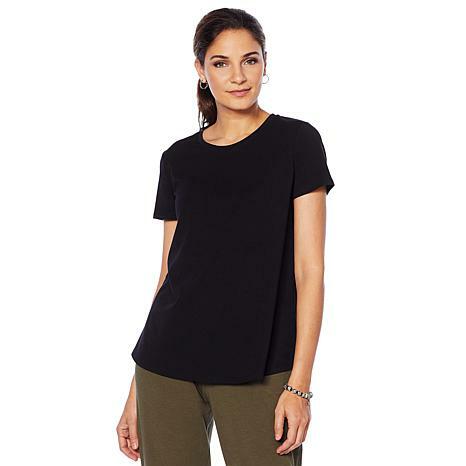 This graphic tee gives you elements of comfort and chicness so you can master the art of transitional elegance. 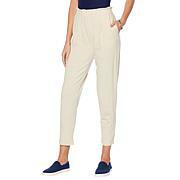 Layer it under a blazer for work and pair it with a skirt and pumps for dinner with friends.